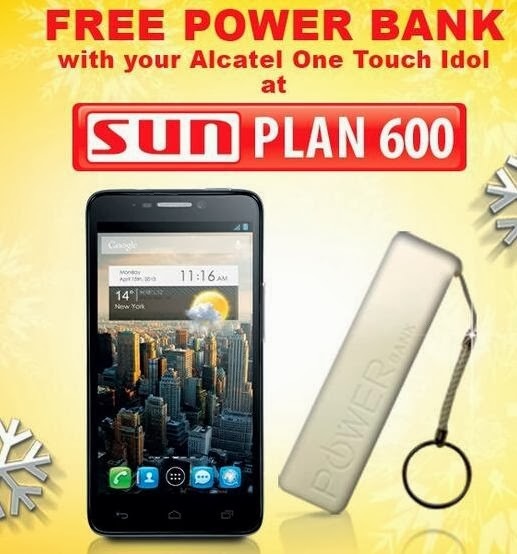 Sun Cellular revamps their postpaid plan of Alcatel Android phones, you can now get a free power bank when you subscriber to Plan 600 with free handset Alcatel One Touch Idol. Own this 4.66-inch smartphone powered by a dual core processor with 1 GB RAM and up to 32GB storage using external memory card. It has 1800mAh non-removable battery but you don't need to worry about is up time as Sun bundled a free power bank on it. Sun Plan 600 has 3 profile you can select when you apply, the 'Unlimited call and Text', 'Text Unlimited' and 'Fully Consumable. You can select 1 from that option that fits your lifestyle and needs, make sure to decide which profile you want to select before availing this plan. I'm not quite sure if you can change plan profile monthly, you can inquire it when you're in the Sun shop to make sure about that matter. They do offer Alcatel One Touch Scribe free on the same amount, in case you're interested with that handset you can inquire Sun cellular via hotline and stores nationwide. This plan does not include internet browsing but you can use your consumable to access mobile internet or you can avail to their affordable Sun Broadband Plan 100 .
available din kaya tong alcatel sa globe ?